Steven (Chicagoland, United States) on 11 December 2009 in Architecture and Portfolio. 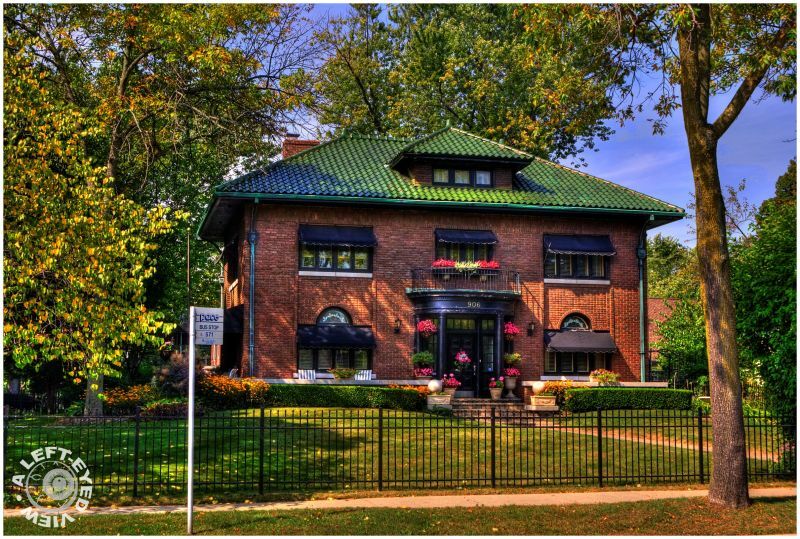 Pictured here is one of many homes located in the Near North Historic District in Waukegan, Illinois. As much as I dislike fences, the wrought iron fence that was erected here added the finishing touch to this property. I remember when this house had brown trim, which seemed to blend with the facade. The black trim really "pops" here. Processing this in HDR helped bring out the detail of the facade which was heavily shaded. However, I am "on the fence" about how the awnings break up the Palladian windows on the first floor. Photo taken September 19. 2009. J'aime bien le rendu des couleurs de cette image. that is one beautiful home ! The green tiles on the roof just rock! Amazing image - the colors are so vibrant ! Great treatment! That is a gorgeous house. Your processing is superb. The HDR is nicely done and not over-done as often happens. This beautiful composition, very successful, and a superb treatment I love, and bravo! I love your HDR technics Steven, it really enhances the world. Everything looks fairy. a beautiful home and image. you're probably quite right in regards to the awnings on the 1st floor windows, those wonderful half-moon windows would look better unobstructed! The processing really brings out the beautiful character of this residence. I agree the wrought iron fence adds a nice touch. To keep uniform with the second floor matching awnings on the lower level do appear to take away from the stylish windows. My opinion, I think it looks fine. This area and the other home reminds me so much of Grosse Pointe, Michigan an area near where I grew up. a very light hdr and a lovely composition -- what did you do differently this time? @dj.tigersprout: I couldn't do any "heavy" HDR treatment as it just wasn't coming out "right." But it allowed me to highlight the facade which was quite shaded and dark in the original RAW capture.